Please note! Temporary campsite open 5/6 - 31/8 2015. Temporary campsite with limited service. There is a new indoor water park nearby with adventure area. Next door is the open air water park and our new lake park. For more information call +46 (0)19-58 86 83. Low rates all season 2015. Admission to the water park included in the fee. RESERVATION, call the camping +46 19588683, Monday-Sunday, between 09.00-20.00. Admission to the Djupadalsbadet open air water park with heated pools included in the price of camping. Café with kiosk and mini golf adjacent to the water park. Family entertainment on the open air stage in the park area on a number of Wednesdays in summer. Walking paths and green house with restaurant in the park area. 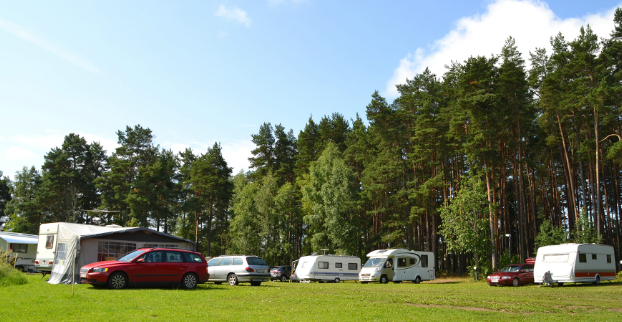 Kumla centre with shops and restaurants within comfortable walking distance from the campsite. Excursions in the area: visit Konst på Hög, Lithells sausage factory with shop and Marieberg mall.